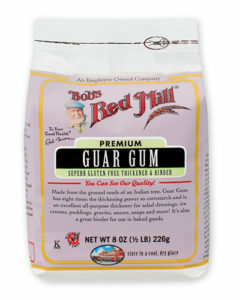 Where to Buy Food Grade Guar Gum? If not in your local supermarket, you might find guar gum in specialty or health food grocery stores. Of course, you can always purchase it online as well. Though primarily used in food production, you still want to be sure you are getting quality, food grade guar gum. Some good, highly-rated brands are Bob’s Red Mill and Now Foods. The seed of the guar plant has a galactomannan (polysaccharide) in its endosperm called Guar gum. It is largely cultivated in India, Pakistan, and semi-arid parts of Brazil, Australia, and South Africa. Similarly, in the United States, there has been some production in Arizona and Texas. The importance of this gum in food application is due to its unique functional properties like water retention capacity, reduction in evaporation rate, controlling ice crystal formation and freezing rate, and modifying rheological properties (e.g. thickening and stabilizing). Structurally, Guar Gum is a very favorable product for the food industry, due to the higher galactose branch points, which make it easily attachable to the remaining composition of a food article. This property, in turn, does not let the liquid phase leech out. Guar Gum is popularly used as a stabilizer in ice creams. Ice cream manufactures try to avoid the formation of ice crystals. The risk of this problem increases greatly after shipping the product to retailers, particularly once purchased by the end user. Think of all the times you’ve taken out a container of ice cream and allowed it to thaw a bit so you can scoop it, then put it back in the freezer. After doing this a few times, you’ll start to notice ice crystals forming. Adding this gum slows (but does not entirely prevent) the formation of these ice crystals during the freeze thaw cycle by slowing down the mass transfer across the solid liquid interface. Additionally, it can help provide good body to the ice cream. Mostly used as an alternative to gluten, Guar gum has been increasingly used in baked goods. It is an excellent hydrocolloid and it reduces the moisture preservation while baking – ultimately resulting in drier baked goods that have better shelf life, as dry cakes do not turn sticky. It also retards fat penetration in baked food because of its thickening ability on hydration, providing greater resiliency and improving texture and shelf life. In dairy products it is used to thicken milk, yogurt, and liquid cheese products. It helps to maintain the homogeneity and texture of ice cream and sherbets. As a polysaccharide, it is also a dietary fiber that is used in some fiber supplements. Without getting too detailed, the ability of guar gum to regulate moisture content can be very useful in keeping one’s self “regular”. Be the first to comment on "Guar Gum"